The decentralised and private nature of small-scale renewable energy development does not fit traditional models of government planning and oversight. The land use impacts related to these developments are not well understood and data is lacking related to the environmental, social and economic impacts that can occur under various scenarios. 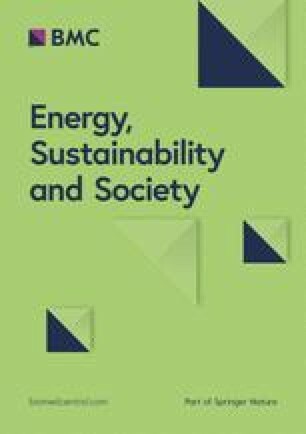 This research note provides a literature review of the scarce information available about the spatial impacts of small-scale renewable energy and outlines the current stream of research being undertaken to address this knowledge gap. The preliminary case studies in Overijssel, the Netherlands and Navarre, Spain provide the background for understanding this complex issue, and a new integrated policy and land use model is introduced in order to combine qualitative and qualitative data that is important for understanding the dynamics of this growing field. The main difficulties in moving forward in planning for the decentralised renewable energytransition are the variation of perspectives on the attractiveness and appropriateness of urban renewableenergy (RE) development, differences in implementation processes and incentives, the dynamic nature ofthe relevant technologies and the lack of up to date information on land use. Multi-functional land use is a key strategy for increasing the uptake of small-scale renewable energy but little to no data is available regarding it in European land use literature and policy. This needs to be addressed in order to enable pragmatic policies that will enable effective implementation of renewable energy. Decentralised and smaller-scale approaches to renewable energy may facilitate or accelerate implementation under certain conditions. Key elements supporting this hypothesis are (1) larger projects have more visible spatial impacts and projects with high spatial impacts are slow to develop in places with strict planning regulations and where land use changes are open to public debate1 and (2) larger projects require large investment of capital which developers may be unwilling to outlay when economic or legislative changes generate instability in the sector . Some articles exist with respect to the spatial implications of land-based photovoltaic energy (PV) installations [2, 3, 4] and the landscape impacts and related implementation issues of wind turbines [5, 6, 7, 8]. However, there are few local or sub-regional scale studies on implementation or land planning conflicts specifically due to displacement or incompatibility of uses with the development of renewable energy-related landscape features (RELF). RELF are the physical structures necessary for the deployment of renewable energy (RE). This is an important area of study since there has been a relatively recent emergence of local RE developments aligned with the transition to a more decentralised energy model. Often due to the smaller impact per installation, the typical environmental impact assessment (EIA) or related planning instruments do not apply and installations can go “unnoticed” from a planning perspective2. We focus principally on wind and PV developments since they can be achieved through both large- and small-scale activities, which are important for increasing the resilience of the energy supply in a given region or locality. This research note corresponds to research being undertaken as part of the EU FP7 funded project COMPLEX: Knowledge Based Climate Mitigation Systems for a Low Carbon Economy. The efforts involve better understanding how contextual (qualitative and quantitative) data can be used to understand land use patterns and possible future scenarios of local renewable energy in the Netherlands and Spain. We provide here the results of our literature review of the available knowledge on spatial impacts of RE and a summary of what this means for researchers attempting to understand this dynamic field. Our main research in this project is related to the relationships between land use change, renewable energy development and policy. We dedicate this research note to increasing the visibility of how current data is limiting us in understanding this dynamic and important relationship. Secondly, we introduce very briefly the model being developed to help us understand these relationships and relevant case studies that we are applying it to in order to advance future studies in understanding the spatial impacts of RE. As such, this research will support future efforts in the fields of land use change modelling and those involved in areas of public administration research-related policy implementation. The spatial impacts of implementing various renewable energies (RE) are complex and dependent on the technology as well as the particular context in which RELF are implemented. They may be visual, physical, functional, long-term, short-term, easily reversible or not, etc. Spatial impacts are related to the topography of the landscape, the area of land physically covered by RELF, the current land use and geography, the distance from areas of natural beauty or sensitive ecosystems and biodiversity . Full attribution of spatial impacts of RELF requires an understanding of the entire implementation and usage process chain; impacts may include changes to existing infrastructure, land conversion and agricultural productivity impacts, ecosystem modifications and habitat and biodiversity reduction, aesthetic changes and adjustments to recreational potential. Some spatial impacts, such as the negative impacts of wind turbines on bird populations (ecological impacts), landscape visual quality (aesthetic impacts) and disruption to food supply from transforming agricultural land to biofuels (direct land use impacts) are widely known. Other related aspects, such as land use intensity, indirect land use change and land multi-functionality have received less attention in the literature. In the following paragraphs, we provide a review of the literature relevant to the question of spatial impacts associated with solar PV and wind energy implementation and then include a more detailed discussion of land use, the key focus of this paper. Much literature relevant to the potential spatial impacts of RE development was identified; however, significant gaps do exist. The spatial impacts of solar energy installations are generally less well studied than for other RE types. The impact of solar thermic (ST) energy is likely to be minimal, since this is mostly associated with heating systems added to buildings , but the spatial impact on the territory of PV installations may be quite substantial. In addition, though the literature on wind energy is abundant, few studies seem to relate to the direct land use impacts of wind installations, a key concern of our research. Overall, precise assessment of expected and real impacts was generally sparse for all RE types. One exception to this is that spatial impacts due to land use transformation from food to biofuel have been deeply studied; however, the focus on RELF requires information on the location of these “crop installations”. Gathering the information related to this is seen as a particular issue in and of itself as crops for biofuels are not distinguishable from regular crops from a land use perspective. As such, we have chosen not to include biomass-related RE in this research. Alterations to land use can be expected to occur for all new RE installations. PV installations and wind turbines that are not located on top of already existing infrastructure will reduce the ability to use the land for other activities, though to different degrees based on the previous land uses and the type of project implemented. While for example, it could be expected that much agricultural land would be too valuable to turn into PV fields3, new standards requiring a percentage of utility supplied power to come from renewable sources is resulting in large-scale PV projects expanding into a wide range of locations and ecosystems that were once considered uneconomic. The potential land use issues and concepts related to PV and wind installations found in the literature are highlighted below. Construction phase impacts are relevant to the installation of PV or wind installations . Large-scale wind installations together with their associated access roads and electricity supply infrastructure have major direct impacts and are compatible only with some existing uses (e.g. forestry, pasture). Literature relating to impacts of wind turbines however mostly deals with issues around ecological or visual impact of the erected turbines. Research with stakeholders to estimate the social cost of wind farm developments in Saragossa (Spain) identified loss of natural areas and the impact of access road construction as key impacts . In this work, stakeholders consulted in the Spanish region of Navarre noted that the impact of access construction was one of the factors that provoked public controversy when the first wind farms were developed in the 1990s (Martínez Alonso P, Hewitt R, Pacheco JD, Román L, Hernández Jiménez V, Bressers H and de Boer C: Losing the roadmap: Renewable energy paralysis in Spain and its implications for the EU low-carbon economy, Submitted). A lack of assessment procedures established at an international level for PV is also contributing to this gap . The concept of land use intensity is important when addressing the land use impacts from installation and operation of large-scale PV plants . Land use intensity is a metric that expresses the quantity of land transformed relative to power output or unit of electricity generated. The land occupation relative to the time the power plant is in use is also important and should take into account the time required for the land to recover following use. While land use intensity for large-scale solar installations and coal plants was comparable in the short-term over the long-term PV installations required lower land areas for equivalent energy generation capacity . These authors found that recent commercial PV power plants in the USA covered an average of 25 km2/GWp. They estimated also that in cases where the PV systems were installed in forest areas that recovery of the forest requires an average of 10 years. Additionally, they calculate that a 30-year-old PV plant occupies ~15 % less land than a coal power plant of the same age. The study of overall land coverage of PV panels that has increased due to legislative incentives in Italy quantified the future potential impact with an assumption that between 7 and 10 m2 of surface area is necessary to generate 1 kWp . A continuing increase in the installed capacity of 10 MWp per month would then result in between 80,000 and 100,000 m2 of additional PV land cover per month. These studies are surprising since they challenge two key popular assumptions: (1) that solar installations always occupy far less land than coal plants—in fact, their impact is initially comparable and only begins to show advantage after ~25 years—and (2) energy generation capacity of solar is per se less intense than all fossil fuels—something that can be seen to be untrue if intensity is measured over the lifetime of the plant . These impacts are related to land-based PV, not those that are implemented on top of existing infrastructure. More generally, the available literature suggests that, besides the various negative impacts, there may be a number of potential land use benefits of PV systems. PV projects can be used to reclaim degraded land and reduce requirements of transmission lines of electricity grids, be used in scenic areas and National Parks, where the avoidance of pylons and wires is a major advantage, can be integrated into the façades of buildings, used as a cladding material for commercial buildings and provide shading and heat extraction . Additionally, greater multi-functionality is generally more possible than with many other energy technologies. Placing PV panels on top of existing infrastructures rather than on forested or farmland can also prevent biodiversity loss . The main negative land use impacts related to PV systems are the loss of amenity; the implementation of a PV system in once cultivable land limits the soil productivity in that area . The electricity output in this case is then competing with food production and as such is similar to the dilemmas faced by energy crops . Some negative visual aspects have also been noted, but there is little certainty about how these impacts are experienced. The literature on aesthetic or visual landscape impacts resulting from RE installations relates mostly to wind energy as widespread deployment of wind turbines has taken place over the last 2 or 3 decades. Since this literature is extensive, the following summary is intended to be illustrative rather than comprehensive. Generally, the research on the aesthetic impacts of solar is based on solar cells that are not added to previous infrastructures. This needs to be considered when determining the relevance of these impacts to the context at hand. “One of the most difficult-to-quantify…environmental costs is visual impacts, whether from wind, solar or hydropower developments” . These authors used choice modelling techniques based on stakeholder interviews to estimate the social cost of wind farm developments in Saragossa, Spain. Respondents tended to value impacts on flora and fauna more highly than impacts to the visual landscape or to the area’s rare geological heritage. This study is notable in that it recognises that wind farm developments have significant social costs and that these costs can be assessed through engagement with local stakeholders. In a study of annoyance due to wind turbine noise in Sweden, it was found that interviewees in a municipality in the south of Sweden were more likely to report annoyance due to turbine noise if they felt that turbines negatively impacted the visual landscape . In general, respondents accepted the necessity of wind turbines but felt that their contribution to the landscape scenery was negative. Further, a 2007 study of renewable energy planning in the Netherlands, found the visual evaluation of the impact of wind power on landscape values to be the most dominant factor in community acceptance of such schemes . Although there seems to be broad general consensus about the importance of visual impact of wind energy developments, not all authors explicitly consider it . Stakeholders interviewed in this study’s Navarre case considered that public controversy related to installation of wind farms in the 1990s had now mostly been resolved  thanks to public information campaigns and growing general awareness of environmental issues. Other parts of Spain have seen political disagreement between autonomous communities (e.g. between Castille and Leon and Cantabria) over the visual impact of wind energy installations in border areas of landscape beauty . For solar energy installations , the aesthetic impacts of PV installations can be quantified based on four criteria: visibility, colour, fractality and concurrence between fixed and mobile panels. This study determined the overall impact by expert opinion through a Delphi procedure. Different impacts were generated by different types of plants in different types of landscapes. The proximity to urban or recreational areas was however not taken into account, and so this study can better be seen as potential aesthetic impact since frequency of impact was not considered. Analysing subjective reactions requires a cognitive study of people’s preferences for PV power plants. There is yet no psychological research specific to PV power plants in the literature according to , and this would be extremely important for highlighting successful opportunities for implementing these projects in urban and semi-urban areas. The only empirical result related to land use impacts was that differences in size were important in the overall impact of the subjects and that both objective variables and subjective feelings were taken into account when making their judgments. A scoping survey completed in the province of Overijssel found that among those (N = 15) that completed the survey, the landscape implications were of lower importance in the development of PV energy than other factors such as importance for the environment and economic benefits. Implementation of RELF may also imply changes to the land as a public amenity. Metrics for the impacts of RE installations on recreational resources have not been developed but would likely be similar to the aesthetic impacts mentioned earlier . However, additional factors may need to be considered such as loss of public access. While wind farms may be accessible to the public, in most cases, PV arrays are not. Ecological impacts relate to habitat loss or damage, such as insect and bird death from intense light generated by solar installations or wind turbines, and increased use of resources such as water. The impact of wind turbines on birds has been widely studied, e.g. [6, 7, 8], and the importance of this aspect for assessing the environmental impact of windfarms is well-recognised. In the previously mentioned study, stakeholders in Saragossa valued impacts to flora and fauna more highly than other landscape impacts . The authors include resource depletion in their list of environmental impacts of PV systems, since their manufacture required scarce materials (In/Te/Ga). A 2009 study of the territorial and landscape impacts of PV systems identifies impacts from landscape fragmentation, vegetation degradation, interference with flora and fauna as well as microclimatic change caused by the daytime warming of the surface of the solar array . Concerns have also been noted about impacts to wildlife, which may prohibit solar development on large areas of desert land in California . In terms of habitat and biodiversity impacts, research continues on measuring habitat fragmentation and risk assessment of complex ecosystem collapse. Land use intensity is often used as a proxy for assessment of impacts on biodiversity . However, biodiversity can be directly measured by species density (recorded in the Millennium Ecosystem Assessment), and PV installations can be sited accordingly in less biodiverse areas. The water needed for cleaning solar panels is approximated at 500–1000 gallons per MWp of panels per year . The hydrological footprint of large solar arrays, particularly in arid or semi-arid environments, is likely to be considerable. The term energy sprawl addresses the varying spatial extents of different energy production techniques . It is the product of the total quantity of energy produced annually (e.g. TW h/year) and the land use intensity of production (e.g. km2 of habitat per TW h/year). This is used to address the potential habitat effects of energy sprawl and to show that more compact energy generation does not necessarily reduce damage to biodiversity. Particularly important is that energy production techniques can have multiple effects on biodiversity, which “operate at different spatial and temporal scales. Biodiversity impacts that are likely to scale with real impact include habitat replacement and habitat fragmentation. Further, the longevity of the impacts… also… varies” (; p3). Spatial impacts of different types of RELF can be assessed, but no simple calculation will enable the right technology to be selected to ensure maximum capacity for minimum spatial impact. Instead impacts should be determined based on the particular characteristics of the area in question. Many different criteria for siting of RE installations need to be balanced to take into account the various types of impact from each technology. For example, while the elevation of the wind turbines increases the area of aesthetic land use impact compared to PV, the actual area occupied by PV is the main intrusion into the landscape due to their low elevation and wide expanse. Some impacts resulting from installation of RELF are quickly reversible through the removal of the relevant installations, such as solar panels or wind turbines. In other cases, previous or alternative uses will only return once the previous state has been regained. Clearly, installations in urban areas on rooftops are nearly completely reversible, but large-scale land clearance for wind farms or PV arrays may take decades or centuries to recover. In general, spatial planning procedures do not deal well with the issue of reversibility, often because high value land uses such as urban development or mining are irreversible on a human time scale. Large-scale wind and solar developments in the EU require an EIA, which includes a visual impact analysis. Though there do not seem to be many published examples (EIA studies are mainly an annex to the project itself), a GIS-based visibility catchment (viewshed) analysis would be an appropriate starting point for evaluation of visual impact. Published research exists on the environmental impacts from the manufacturing and decommissioning phases of PV power equipment; however, more studies are needed about the installation and operation phase. Local communities can experience difficulty in deciding the siting of PV installations . Innovative approaches involving participatory cartography are one way to address these difficulties [13, 15, 16]. Modelling approaches directed at RE installation location, such as multi-criteria decision-making (MCDM) procedures  or optimal site potential models , are beginning to emerge and are likely to offer a way forward with respect to the spatial allocation of RELF in line with environmental criteria. This section provides an overview of the two case studies used in this research to understand how local RE development is taking place and particularly what elements of spatial issues are developing alongside it that should be considered. The study of local renewable energy development from a spatial perspective is a relatively new field of study. Two cases were chosen with different spatial contexts in order to develop understandings of relationships that take place in both space-scarce (the Netherlands) and space-abundant (Spain) areas. In the Netherlands, locally based solar implementation is increasing exponentially. Collective purchasing, crowd-sourcing and small-scale solar farms are becoming commonplace. The highly regulative nature of Dutch spatial planning could be used to reduce the changes seen due to solar energy. Currently, this is only being done in cases where the scale is considered to be industrial and not for personal or community use. Discussions are being held at the provincial level about how to incorporate medium-size solar installations in the landscape, but no final decisions have been made. Wind energy is highly regulated and has not achieved much in comparison to other countries in Europe. In Spain, previous advancements made through large-scale wind and solar installations have come to a standstill due to an altered funding environment at the national level. Current developments are considered to be more modest or small scale and need to address more local issues due to the lack of support from higher levels. Connecting the types of local RE projects and the resulting implementation processes and land use impacts that have taken place in these two cases is desired in order to provide us with the necessary preliminary data to simulate and model these relationships. What is missing from the available literature is how qualitative and quantitative social factors increase or decrease the likelihood of implementation of renewable energy in different cases. In this ongoing research, we are using a specially developed integrated participatory land use model APOLUS—actor and policy land use simulator. APOLUS is articulated as two model blocks (see Fig. 1): land demand and land use allocation are connected by a feedback loop. The land demand model block determines the amount of land to be changed or combined with RE uses which is then allocated in the land use allocation model block. Land demand is initially determined for each scenario on the basis of factors exogenous to the land allocation block, but land allocation outcomes are fed back into the demand block so that the system is modified dynamically as RE implementation progresses. To produce simulations of land use and RELF at future dates (e.g. 2020, 2050), the storyline and simulation approach is employed . Storylines are developed through the participatory process and the model represents them. This enables the contextual factors related to the implementation process to be introduced into the model. Determination of RE demand for each scenario is a key challenge. As noted above, the demand model block also needs to consider multi-functionality, enabling the allocation of new RELF in existing land areas. It is anticipated that more multi-functionality of land use will take place in the Netherlands area than in Spain, so some difference in the operation of the system across the two areas is anticipated. As such, the differences and similarities between the chosen case studies will give us a perspective on different European approaches to land use and renewable energy. The model enables us to incorporate geographical, social and economic factors into the development of future scenarios with the help of expert and local stakeholder input. Doing so at a regional/local scale in our two case studies will provide direction as to what type of spatial land use data is necessary for understanding land use changes associated with local renewable energy development. Multi-functionality: No clear distinction was identified between wind and PV energy with respect to multi-functionality of use. In the opinion of Spanish stakeholders, PV energy installation development implies loss of the previous land use, while wind energy was regarded as compatible with other uses. This is quite different to the current situation in the Netherlands where there is strong resistance to wind energy because it is viewed as incompatible with the landscape, yet PV on roof tops is generally accepted. Since multiple land uses are not recorded under Corine land cover data, it is not possible to verify whether there were good examples of compatibility of land use from the maps. It is very important that the simulation model take multi-functionality into account since under some circumstances, RE must be incorporated into the existing land uses without taking them over. Temporal resolution of innovations: Another challenging aspect of this research is the speed at which changes are taking place and the minimal level of oversight which can occur. This is particularly visible for the diffusion of PV panels in the Netherlands. An underlying hypothesis is that new projects are influenced by the presence (or lack) of other PV panels in the area. Detecting the presence of any causal aspects to this relationship implies a need for data on a highly detailed temporal scale. However, since this level of detail is not present in the available open data, the model will be tasked with simulating this process. By generating plausible outcomes from multiple model runs, the simulation model serves as a virtual laboratory for exploring the spatial and temporal diffusion of these processes. Path dependency: A further challenge to the successful development of future scenarios is the underlying assumption that the past land use relationships will hold in the future (path dependency). Using past land use changes relationships as the basis for the scenarios has a number of issues. As technologies change, the underlying characteristics of RELF also change. This is true particularly with respect to the footprint and aesthetic impacts that are related to a technology. To address this, we include a certain amount of randomness into the development of scenarios and will also include the changes in potentially influential contextual factors as variables in the model. The spatial allocation component of the model and the cellular automata model of White and collaborators  is especially suitable for this kind of work, since small changes to model parameters can produce highly divergent outcomes as the simulation progresses, a feature known as bifurcation. Model results are thus not limited to a few scenarios (e.g. business as usual, renewables super development, continued fossil fuel dependence, etc. ), but instead produce a broad range of possible options based on the various bifurcations from each scenario path. Multiple model runs can be used to assess the probability of the various outcomes. Model results can assist policymakers in assessing the likelihood of the developments having an impact in their particular area based on the timespan over which they expect their policies and plans to be relevant. The need for additional and interdisciplinary studies related to the development of local renewable energy is clear. The multiple types of RELF possible will have significant and varying impacts on the speed and success of the energy transition in various places. The increasingly private and local nature of renewable energy development increases the complexity of monitoring and understanding these processes. We aim for this study to provide some insight into the gaps and lack of information available for policymakers and planners in preparing, supporting and steering the local, decentral renewable energy transition. The exception to this is the case where changes are required for flood safety, in which case the high level of public acceptance can slightly speed up the necessary processes. Recently, Spain approved a new law on EIA (Law 21/2013, 9th of December, of Env. Impac. Asses.) relaxing these instruments further: photovoltaic installations under 10 ha. Do not require study as well as those dedicated to self-consumption under 100 kW. See results of the land use analysis for the Navarre case study, end of Section 4.2. The research presented in this paper is conducted and funded from the EU FP7 project number 308601—COMPLEX. Further detailed information is available on the project website. CDB coordinated the development of the paper, contributed to the Dutch research and text of the paper. RH coordinated the team in Spain, contributed to the research, contributed to the text of the paper and revised the manuscript. HB contributed to the Dutch research and to the text of the paper. PMA carried out the research work in Spain, contributed to the text of the paper and revised the manuscript. VHJ, LRB and JDP contributed to the research and revised the manuscript. All authors read and approved the final manuscript. This team of authors have grouped themselves together based on their collective work and interest in the effects of social factors in land use change. CDB is currently a senior researcher appointed jointly to two departments of the University of Twente—PGM (Urban and Regional Planning and Geo-Information Management) and CSTM (Department of Governance and Technology for Sustainability) at the University of Twente (UT). Her research focuses on connecting land use data and knowledge with policy relevant instruments and planning. The largest support for the land use change mapping and modelling component comes from the expertise of RH, based on his experience in participatory modelling, land use modelling and software. VHJ has a lengthy profile in community engagement and modelling which has helped to determine the stakeholder participation elements of the research. Both RH and VHJ are members of OCT (Observatory for a Culture of the Territory). The other authors (HB, VHJ, PMA, LRB, JDP) are also affiliated with these two institutions (OCT and UT) and provide expertise on policy implementation, GIS and modelling and land use change and impacts of development.